In stock -This product will ship today if ordered within the next 4 minutes. This powerful `true food` form of Co-Enzyme Q10 is four times more antioxidant than regular Co-Q10. Helps maintain a healthy heart and energy release. Co-enzyme Q10 is important for maintaining a healthy heart and energy release through the years. It is acknowledged that the amount of Co-enzyme Q10 present in the body declines with age, so supplementing the diet may help in maintaining a healthy heart. 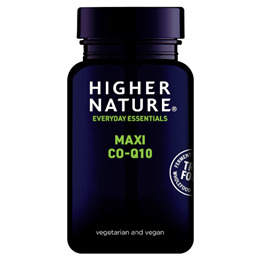 Maxi Co-Enzyme Q10 is available in a capsule which is four times stronger than regular Q10 suppliments. 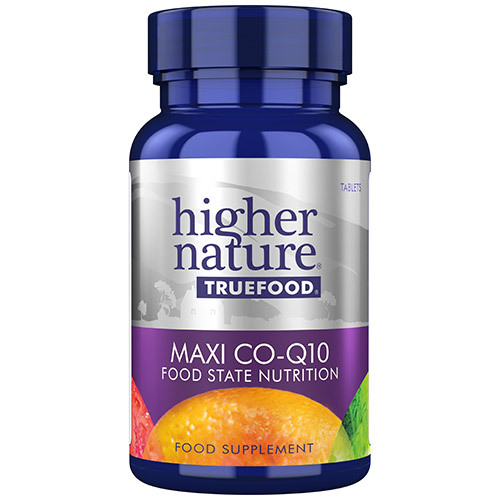 Independent laboratory studies show that 1 30mg capsule of Maxi Q10™ is comparable in antioxidant power to 250-300mg of standard co-enzyme Q10 supplements. Co-enzyme Q10 is a vitamin-like substance whose actions resemble those of vitamin E. It is fat-soluble and is stored in the fatty tissues of the body, reducing the need to ingest large quantities. Since Co-enzyme Q10 is oil soluble it is best absorbed when taken with oily or fatty foods, such as fish. It plays a critical role in the production of energy in every cell of the body. It supports healthy circulation, the immune system and is a powerful antioxidant. Co-enzyme Q10 also works as an antioxidant and may be more powerful than Vitamin E.
Proprietary mixture: co-enzyme Q10 with enzyme digested Saccharamyces cerevisiae (with soya), capsule: hydroxypropyl methylcellulose*; anti-caking agent: magnesium stearate*; anti-caking agent: silicon dioxide. Adults take 1 vegicap a day, with or between meals, or as your health professional advises. Below are reviews of True Food Maxi Co-Enzyme Q10 - 60 x 30mg Vegicaps by bodykind customers. If you have tried this product we'd love to hear what you think so please leave a review. The anti-caking agents have been included in this product to avoid the powder inside the capsule becoming solid. Question about True Food Maxi Co-Enzyme Q10 - 60 x 30mg Vegicaps Are the True Food supplements suitable for those with an intolerance to yeast? Question about True Food Maxi Co-Enzyme Q10 - 60 x 30mg Vegicaps Are the nutrients in the True Food range synthetic? Question about True Food Maxi Co-Enzyme Q10 - 60 x 30mg Vegicaps Is it safe to take coenzyme q10 if you have a cholesterol of 6.9 and are on statins? Statins (such as simvastatin) actually reduce the amount of coenzyme q10 available to the body so supplementing your diet with coenzyme q10 while taking prescription statins is advisable. Question about True Food Maxi Co-Enzyme Q10 - 30 Vegicaps - Best before date is 31st May 2019 Are the True Food supplements suitable for those with an intolerance to yeast? Question about True Food Maxi Co-Enzyme Q10 - 30 Vegicaps - Best before date is 31st May 2019 Are the nutrients in the True Food range synthetic? Question about True Food Maxi Co-Enzyme Q10 - 30 Vegicaps - Best before date is 31st May 2019 Is it safe to take coenzyme q10 if you have a cholesterol of 6.9 and are on statins? This powerful true food form of Co Enzyme Q10 is four times more antioxidant than regular Co Q10. Helps maintain a healthy heart and energy release.